Along with cold temperatures and wardrobe changes, winter brings its own set of skincare challenges. 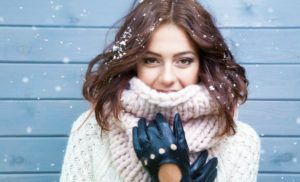 And if you have a skin condition like acne or rosacea you are probably keenly aware of how the cold winds and indoor heating can exacerbate them. Before redness, chapped skin or further breakouts set in, why not overhaul your skincare routine for winter? With a few simple changes you can beat the discomfort and ensure the weather doesn’t wreak havoc on your skin. Winter calls for a creamier cleanser, in order to avoid stripping the skin of its natural moisture. In summer, when sweat, sunscreen, and sebum are an issue it can feel great to use a foamy cleanser, but during drier weather it’s best to use something more gentle. If you have very sensitive skin you can also consider a soap substitute, as even the mildest cleansers may still irritate your skin. Though it may sound counterintuitive, those with acne are encouraged to use only a very mild soap or cleanser and avoid washing their faces more than twice a day. This helps avoid drying out the skin and having it compensate by producing more pore-clogging sebum. Even wetting the skin can cause it to become dry, and this is only made worse by hot water. High heat dissolves the skin’s protective barriers, so as tempting as it is to immerse yourself in hot water and steam after a day of braving the cold, try to bathe in warm water only. Trade-in lighter summer lotions for heavier skin creams that contain fatty acids, butters, and natural oils. These emollient ingredients reduce water loss and provide the skin with a protective layer. Especially if you have acne, do ensure that your face cream is non-comedogenic, meaning it won’t clog pores. Those with rosacea may want to look for heavier creams that contain soothing ingredients such as chamomile or aloe vera, which can help calm the skin and prevent redness. Add extra moisture and protection to the sensitive eye area with an eye cream for winter. This is just another way to keep your skin hydrated during cold, drier weather. Central heating doesn’t help with dry skin; the hot air can cause the skin to release moisture and dry out more quickly. Using a humidifier, or even bowls of water near your radiator, can help you maintain a good balance, allowing you to stay warm inside without doing a number on your skin. Dramatic changes in temperature, such as coming into a warm building from the cold windy outdoors, can result in inflammation of the skin. It causes the capillaries on the surface to expand and contract, which leads to redness. Minimise inflammation by keeping your home temperature at a reasonable level of warmth, and wrapping up well in the cold – perhaps wrapping a scarf over your nose and mouth to protect your skin. Rosacea sufferers can find further relief from the burning and redness of inflamed skin by using Mirvaso, or brimonidine. The drier weather helps reduce breakouts and inflammation in some people with oilier, acne-prone skin, but a poor diet during this time of year can have the opposite effect. Studies have suggested that a diet high in refined carbohydrates, which cause a spike in blood sugar, can also increase hormones. Try to curb comfort eating during the colder weather and instead consume plenty of fruit and veg to keep your skin clean, clear, and nourished from within. Both acne and rosacea sufferers can benefit from an invigorated skincare routine in winter. The idea is to avoid drying out the skin and then increasing the risk of dead skin cells clogging pores, and avoiding the dryness and inflammation suffered by those with rosacea. Posted on October 28, 2016 November 29, 2017 by Dr Tony Steele in Acne, Rosacea.